The spectacular 69.42 carat tear drop shape diamond went to auction in 1969 in New York City. “Originally I wore the diamond as a ring, but even for me it was too big so we had Cartier design a necklace” states Taylor. The Burton-Taylor diamond made it first appearance in Monaco at Princess Grace Kelly’s fortieth birthday party. 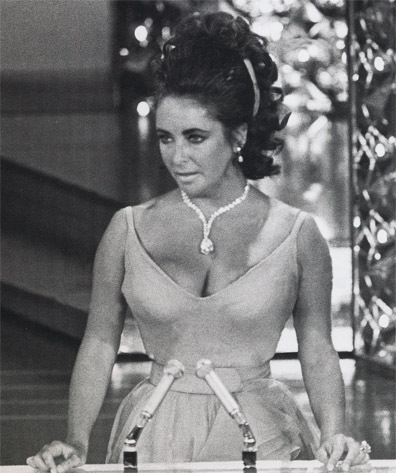 Elizabeth Taylor wore it with a black velvet cape with scorpion motifs to celebrate the Princess’s astrological sign.